"A good ad experience is good for everyone: users, advertisers and Google too. AdWords is built on this idea, and one of the key ways we make that good experience happen is by measuring the quality of your ads. Our measurement of quality helps us show more useful ads in higher positions on Google.com search results pages, so that users see ads that are relevant to their query and advertisers get clicks from qualified users. Besides creating happier users, those high-quality ads have the potential to earn extra benefits for advertisers, like lower costs per click and eligibility to surface more information with ad extensions. 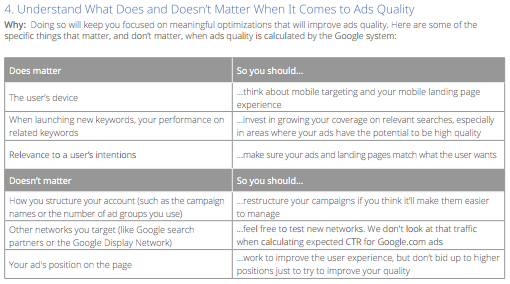 This makes ad quality critically important to AdWords advertisers. Yet there are plenty of misconceptions about the topic, specifically about the metric Quality Score that’s reported in your account. In an attempt to clear up some of those misconceptions, we wanted to explain how advertisers should think about and react to their Quality Score metrics. " "Remember, too, that there are differences between auction-time quality and the 1-10 Quality Score number that appears in your account. Your Quality Score will give you insight into how you’re performing, but “chasing the number” shouldn’t be the focus of your optimizations. Be relevant, be compelling and drive traffic to landing pages that deliver on what you promise in your ad, and you can feel confident your score should reflect that quality"